Successfully Added High Power Mobile Phone Jammer with Remote Control to your Shopping Cart. 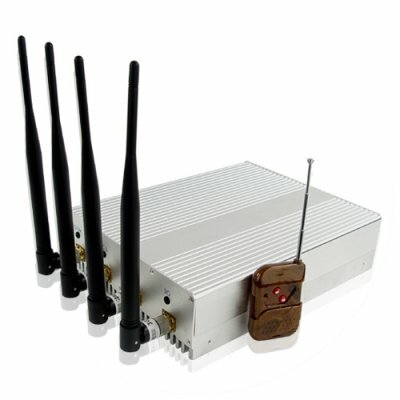 High Power Mobile Phone Jammer with Remote Control. This powerful device provides you with industrial strength frequency jamming with 10 Watts of output power and high gain antennas. The phone jammer is designed to give you a typical operational radius of 30 meters (approx. 100 feet) - phones within this range are jammed. Easy to use, effective and versatile, this unit does not require any maintenance from the user. Additionally, the special casing is designed to dissipate all generated heat from the unit, ensuring no down time and protecting the circuitry. Just set it up and leave it on - it's as simple as that! What also makes this unit so special is the remote control supplied. If you are in a working area with good line of sight to the jammer, you can make use of the remote control to ensure you can still easily turn it off temporarily when you need to call out. This user-friendly Cell Phone Jammer would be perfect for those who really need to have a truly professional designed and produced device for simple set-it-and-forget-it operation. To insure the secrecy and/or the tranquility of your operations, purchase one today. This jammer is available now direct from Chinavasion at a superb wholesale price.